When I was young (alas, quite a long time ago) my mom would take us to the library every two weeks. There is no way I can express how important this was in my journey toward being a teacher and a writer. We didn’t have much money, but we had a wealth of information at hand, in the form of borrowed books. As I made the transition from young adult fiction to things written for an adult audience, mom was a valuable guide, because she was quite a good reader herself. One day, she handed me a book with a title that was a bit unusual: The Impossible Virgin. I’m sure I said something like, “Really, Mom?” She assured me that she had read it and that I would like it. OMG, was she right. I really loved that book. Peter O’Donnell wrote an entire series of books featuring a better than James Bond heroine, Modesty Blaise, and The Impossible Virgin was my introduction to the series, although it is actually book five of thirteen books. The books generally followed a pattern, a bit like a James Bond movie of that era, wherein there is some action sequence at the beginning, then some exposition to get the reader up to speed on the characters, plus plenty of mid-level action before a dramatic series of events that leads to a climax with a very short denoument. Each book is decorated with highly eccentric characters, both the villains and the “guests” that Modesty and her friend Willie Garvin are helping with whatever dastardly doings drive the action. The Impossible Virgin centers around Modesty’s guy friend, a doctor named Giles Pennyfeather. He gets involved with some bad guys over in Africa, and Modesty helps him out. Later, Giles and Modesty are abducted by the baddies, and friend Willie is thrown out of a plane without a parachute. Giles ends up injured by a gorilla, so he has to walk Modesty through performing an emergency appendectomy on one of the minor characters, and all that happens before the big climax, which involves a battle with quarterstaffs and a heck of a lot of wasps. Most of the books in this series are really good, and I have all of them. Some books spend very little time with me, as they are forgettable, but The Impossible Virgin, along with others in the series, including Modesty Blaise, Sabre-Tooth, and I Lucifer are on my keeper shelf, and I have re-read them from time to time. Modesty Blaise was the subject of a truly horrible movie, so bad that I try to forget that it was ever made, and a really good short film still available on DVD by Quentin Tarrantino, entitled My Name Is Modesty . Mr. O’Donnell also wrote some nifty “romantic suspense” novels as Madeline Brent, and those are memorable as well. As a fan of David Weber, I have been most interested in the new venture he has with Evergreen Studios to turn the adventures of his flagship character, Honor Harrington, into a series of comic books, a video game, and eventually, a movie series. I seldom play video games, so I won’t comment on that aspect, but re-imagining the characters in a semi-manga set of comics is an interesting approach to creating a wider audience for Weber’s work. I purchased the actual book (a larger paperback) rather than the eBook, because I wanted to examine the work closely and perhaps share it. I’ve read (and re-read) the books, so I am not the intended audience. Fans of Weber’s prose are probably going to be disappointed, because there are not many words in these books. Comics (graphic novels?) are quite different from prose, and Weber uses lots of words. However to bring Honor off the page and onto film will require story boards, so I am viewing this book, and those that hopefully will come later, as elaborate story boards. Weber has a full page introduction in this book wherein he asks fans to be open-minded about the new approach to his work. On Basilisk Station has a good bit of exposition, and while interesting, it isn’t as tense as some of the later novels, so I found it interesting that Tales of Honor, Volume I begins “in medias res” with the situation at the end of book seven (In Enemy Hands) as the framework for book one. Certainly this approach ramps up the suspense, as Honor faces torture and execution, and remembers these earlier events, because her previous exploits are what led to her capture by the Havenites. A few posts back, I included some art by a cover artist who really captures the Honor Harrington of my imagination, and this Top Cow/Evergreen Studios version is quite a bit different. Still, art conveys meaning in a different manner than words, and just having visuals of Honor and her universe may alienate some fans, but will hopefully attract others. Do I like this book? Well, not really. I very much prefer the original. But is it bad? Nope, it isn’t. Honestly, the comic novel manages to get across quite a bit of the original, in very few pages. The pictures are not cartoons, but have quite a bit of detail. 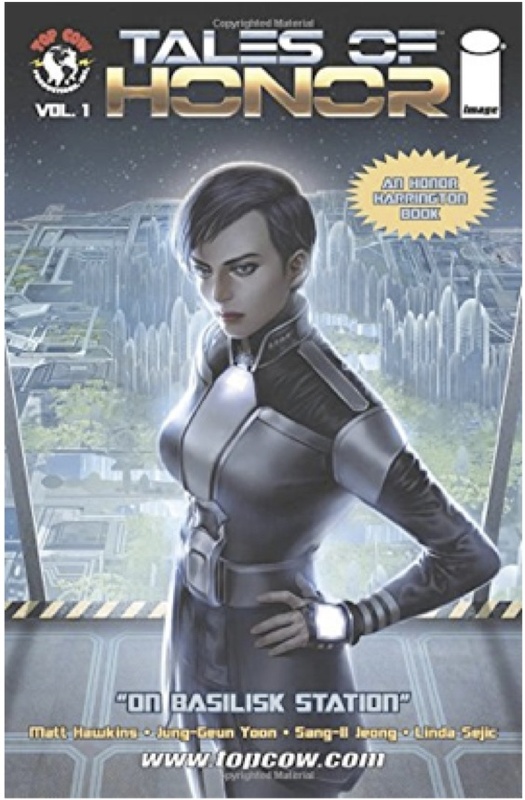 Especially interesting are the panels which explain how propulsion and weapons work in Honorverse. Weber always mentions the devastation of warfare, but the visuals here are more dramatic than words alone. My main problem with Tales of Honor is the problem that fans often have with films—a disconnect between what I previously imagined and what I am seeing. This version of Honor is less beautiful, more menacing, and less subtly nuanced than the one in my imagination. And, the Nimitz in this book is unrecognizable. Really. Are these problems created by the artists, or by my lack of an open mind? As of this writing there is only a one-star review on Amazon, written by a disgruntled fan who is also experiencing this closed-minded disconnect. Hopefully, that will change, because for Honor to become a film heroine, the comic books will need to find more receptive audience. And, I believe Honor’s exploits would make one heck of a good series of movies, so I am gonna hop over to Amazon and leave a review. Often, I choose to read indie published books rather than those from the “big six” publishers, because I find the content of indie books to be a bit more raw, unpolished, and (sometimes) unique. Yes, I am disappointed from time to time (as in my previous post) but I keep trolling for new authors and books. However, recently, Goodreads sent out a newsletter and the science fiction book of the year was Andy Weir’s The Martian. The blurb caught my eye so I bought it, but didn’t begin immediately, as I was slogging through a book on SEO (search engine optimization) at the time. 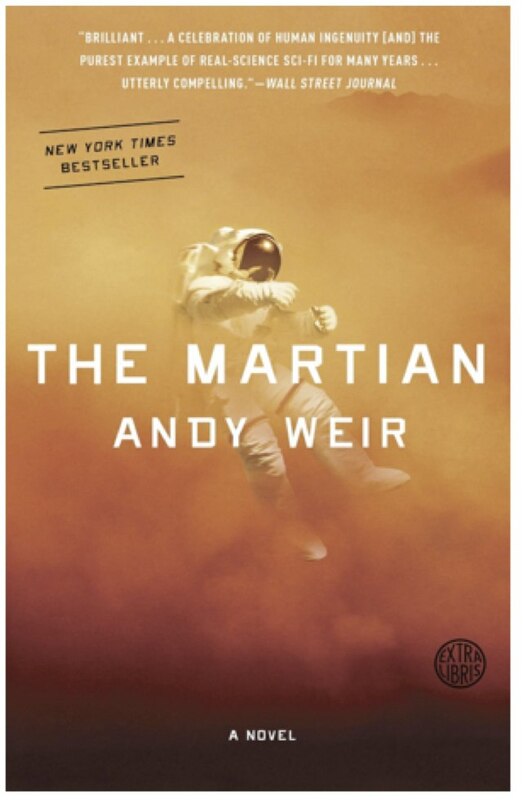 Over the weekend, I began The Martian, and I was hooked. Like from the first page, I was seriously into the story. The plot is not a new one. An astronaut is marooned on Mars. His fellow crew members are on the way home, believing that he is dead. But, this astronaut is determined and a heck of an engineer, so he keeps finding ways to use what is at hand to survive. After a while, the NASA folks figure out he is still alive, so they are trying to figure out how to get him home. Yes, it is really suspenseful. But sometimes it is laugh out loud funny, because the main character is quite a character. Actually, this book was so engaging that I began to question my quest for good indie books. If the big guys are publishing this kind of science fiction, then I should be looking at the best seller lists again. So, after finishing the book, I did a wee bit of research and learned that Weir’s book was originally self-published via Amazon’s Kindle Direct (yeah!) and only after it sold thousands (at 99 cents, because that’s Amazon’s minimum price) in the first three months did big publishing come calling. Now, it is the basis for a movie starring Matt Damon. The book is cool. Weir’s evolution as a writer is seriously cool. Many of the self-published and small press published writers, including yours truly, would love to have this sort of rags to riches experience. The impediment to that is having a really great book. The Martian is such a book. So, my suggestion is read it now and try to wait for the film version. Gravity won an Oscar, so the way is paved for another near future space adventure to do well at the box office. Since Gravity was nominated for 10 Academy Awards, one of our local theatres has given it a second chance on the big screen. I admit, it took a bit of insisting to get hubby to go. “What’s it about?” He asked, and when I explained it is about an astronaut who is trying to get home after a space shuttle disaster, hubby wasn’t interested. Yes, I know, it has a been there, done that plot. Having seen Apollo 13, and some lesser films, all with that same basic plot line, I did understand his lack of enthusiasm. Of course, Sandra Bullock isn’t as young as she used to be. And, once you have seen Star Trek or Star Wars, the space shuttle is just so primitive. Many (mostly amateur) critics have listed all of the stuff that just couldn’t happen, from the lack of diapers on Bullock’s bod to the detachable helmet on the cosmonaut space suit. The lists are lengthy and many of the assertions that “it just wouldn’t happen like that” are correct. Even with all of that, I enjoyed the film. It is in (almost) real time, which is kinda cool. There are some killer f/x showing how things are in a weightless environment, and I do think that is the groundbreaking aspect of this film. It will make you believe, if only for a few moments, that you are in space, right alongside the stars (take that either way.) The dialogue is rather sparse, and sometimes just plain silly, but in real life people can say the stupidest things. Any film that can get people talking about space exploration again is worth a look. This one does a remarkable job of making a perilous situation quite suspenseful, but with a sufficient glimmer of hope that the audience can hang on for a “happy” ending. Perhaps it doesn’t deserve a 97% approval rating on Rotten Tomatoes, but it does deserve a look for any who wants to see what it is like in space.